When Chicago housing prices start trending down, some communities sink further, faster than others. Over the past 4 decades Edgewater east of the El tracks had typically ranked among the fast sinkers, its down-market density portending price-descending destiny. When we took a lengthy look at Edgewater seven years ago, residential development was booming, business was playing catch-up and the community seemed poised for further progress. Sheridan Road was seeing its first significant new construction in decades, including the Atelier, a 39-unit condo development at the corner of Sheridan and Bryn Mawr. 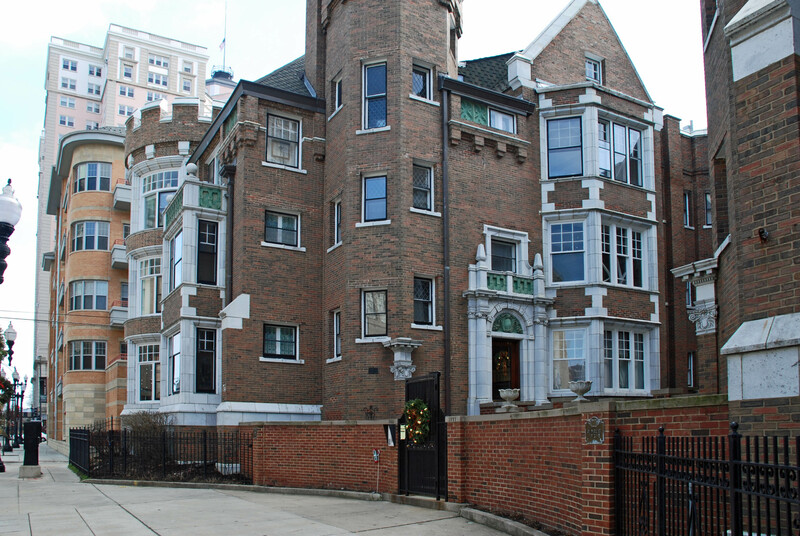 The Atelier is flanked by the Edgewater Beach Apartments and Manor House condominiums, two beacons of the Bryn Mawr Historic District. The building won a 2006 Good Neighbor award and its large 2- and 3-bedroom units sold at prices from high $300s to the $700s. As of 5 years ago yesterday, only one unit, a 2,354 square foot penthouse priced at $759,900, remained available for sale. Until recently the building had seen few resales, but there are currently five units listed in the MLS and resale prices have fallen sharply. Unit 209, a 1,483 square foot 2-bedroom, 2-bath was listed on June 8 for $389,900 and reduced to $229,900 four days later. It previously sold for $405,000 in May of 2007. Unit 409 sold for $425,000 in August of 2008 and is currently under contract at a list price of $214,000. Unit 205 originally sold for $389,000 in March of 2006, resold for $325,000 in October of 2008, and is currently under contract at a list price of $229,000. Unit 403went under contract quickly at a list price of $194,800. Unit 405, purchased for $446,000 in February 2006, has been on the market since January and is listed for sale at $299,000. Three units in the building are currently In foreclosure. A question for Why Berwyn is Berwyn, ¿por qué? It looks like some construction “issues” have come up on the Atelier too – the building was tented last time I drove by (maybe three weeks ago) for what looked like masonry work. It’s all over edgewater. There are units in the East Point Tower currently onsale for under $200k! That building has held steady between $300K and $400K until last year. my own building is looking at six units priced ridiculously under the average sale price for the last five years, including the penthouse, which last sold for somewhere around $700K and is currently listed at $499K. Even the new condos at Granville and Broadway are taking hits of over $100K per unit from a year ago.